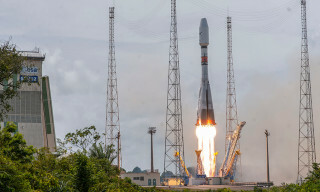 Today, on April 4, 2019, the "Soyuz-ST-B" launch vehicle with the "Fregat-MT" upper stage was successfully launched at 20:03 (Moscow time) from the Guiana Space Center with four European telecommunication satellites О3b, manufactured by Thales Alenia Space according to the order of the Luxembourg operator SES. Now their number in orbit is 16 satellites, and they provide high-speed mobile and fixed communications to residents. This launch was the 75th for the "Fregat" upper stage and the 22nd from the Guiana Space Center. 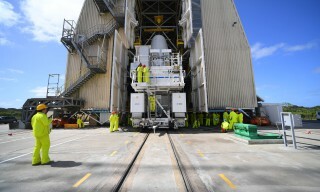 The "Soyuz-ST-B" launch vehicle with Fregat-MT upper stage and four European O3b satellites was rolled out and installed on the launch complex of Guiana Space Center on April 1. On the pre-launch days are also scheduled the autonomous checks of the "Fregat-MT" upper stage and the "Soyuz-ST-B" launch vehicle, control and final tests, as well as checking of the starting readiness of the upper stage. Launch is scheduled for April 4 at 19:30 (Moscow time). Today, on April 1, the "Soyuz-2.1a" rocket with a "Progress MS-11" cargo spaceship was rolled out from the Assembly and Testing Building and installed at the launch pad № 31 of the Baikonur cosmodrome. The RSC "Energia" specialists and other enterprises of Roscosmos performing pre-launch technological operations at the launch complex. The launch of the "Progress MS-11" cargo spacecraft from the Baikonur cosmodrome is scheduled for April 4, 2019. The crew of the "Soyuz MS-12" transport manned spacecraft on March 15, 2019, at 06:10 Moscow time, went on board of the International Space Station (ISS). 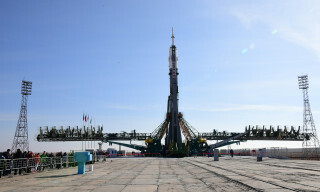 The "Soyuz-FG" launch vehicle with the "Soyuz MS-12" spacecraft, that delivered the Russian-American crew to the ISS, was launched from the Baikonur cosmodrome on March 14, 2019 at 22:14 Moscow time. The docking in the automatic mode was made on March 15, 2019 at 04:02 Moscow time after the ship approached the station according to the four-turn scheme. On March 14, 2019 at 22:14 Moscow time, the launch vehicle "Soyuz-FG" with a "Soyuz MS-12" spacecraft was launched from site № 1 (Gagarinsky Start) of the Baikonur Cosmodrome. At 22:23, the "Soyuz MS-12" spacecraft was regularly separated from the third stage of the launch vehicle in a near-earth orbit and continued its autonomous flight to the International Space Station under the guidance of specialists from the Russian Mission Control Center. 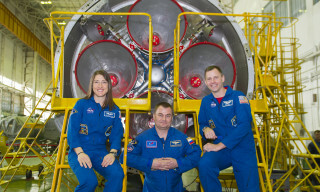 On board of the "Soyuz MS-12" are the members of the ISS-59/60 long-term expedition - Roscosmos cosmonaut Alexey Ovchinin, NASA astronauts Nick Hague and Christina Koch. 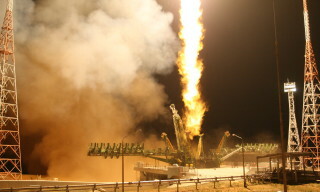 Today, on March 13, the State Commission at the Baikonur cosmodrome approved the main and backup crews of the "Soyuz MS-12" spacecraft and confirmed the readiness of the "Soyuz-FG / Soyuz MS-12" rocket-space complex and the ground infrastructure to the launch according to the International Space Station (ISS) program. The launch of the "Soyuz MS-12" spacecraft with the crew of the next long expedition to the ISS is scheduled for March 14, 2019 from site № 1 (Gagarinsky Start) of the Baikonur cosmodrome. 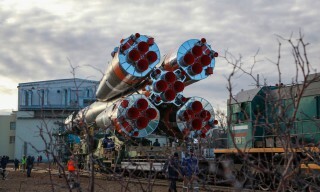 Today, on March 12, the "Soyuz-FG" launch vehicle with the "Soyuz MS-12" spacecraft was roll out from the Assembly and Test building to the launch pad. Works began on the program of the first launch day. The launch of "Soyuz MS-12" spacecraft with the crew of the next long expedition to the ISS is scheduled for March 14, 2019. 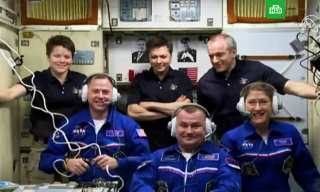 The main crew of the ISS-59/60 includes Roskosmos cosmonaut Alexey Ovchinin and NASA astronauts Nick Hague and Christina Koch. Today, on March 11, representatives of the technical management and the state commission at the Baikonur cosmodrome issued a decision on the readiness of the "Soyuz MS-12" spacecraft and "Soyuz-FG" launch vehicle for roll out and installation on the launch pad. The launch of the "Soyuz MS-12" spacecraft with the crew of the next long expedition to the ISS is scheduled for March 14, 2019 from site № 1 (Gagarinsky Start) of the Baikonur cosmodrome. In the morning of March 10, at the site № 254 of the Baikonur cosmodrome in accordance with the pre-launch preparation plan, the main crew (Roscosmos cosmonaut Alexey Ovchinin, NASA astronauts Nick Hague and Christina Koch) and the back-up crew (Roscosmos cosmonaut Alexander Skvortsov, ESA astronaut Luca Parmitano and NASA astronaut Andrew Morgan) of the 59 / 60th long expedition to the ISS began a control checkup inspection of the "Soyuz MS-12" spacecraft. After the introductory briefing, the cosmonauts and astronauts checked the composition and placement of cargo and equipment in the descent vehicle and the living compartment. 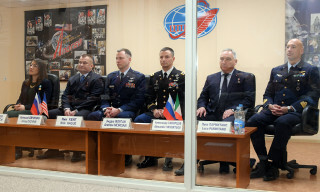 According to the pre-launch tradition, the main and backup crews of the ISS-59/60 also visited the Baikonur Cosmodrome Museum, famous for its unique collection of exhibits. The specialists of the RSC "Energia" at the Baikonur cosmodrome continue to work on the preparation for the flight of the space rocket with the "Soyuz MS-12" spacecraft to the International Space Station. In accordance with the preparation schedule on March 6, the author's inspection of the ship was performed. 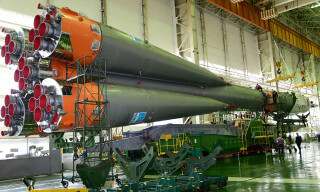 In addition, technological operations of the head fairing rolling of the "Soyuz-FG" rocket were performed. 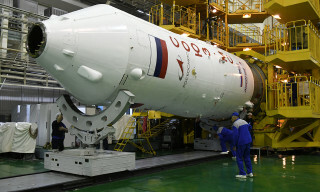 Earlier, on March 4, the spacecraft was docked with the transfer compartment of the launch vehicle.